The 100% FREE product is 30+ pages of free handouts, guidelines, how-to's, rubrics and everything you need to get started with the inquiry-based learning project, Genius Hour. This is a loaded product! *These pages are all ready for edit so that you can make this your own! 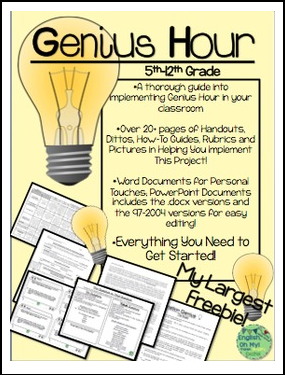 I spent a TON of time creating this product for you, and I wanted to share all my materials for FREE because I would love if more teachers would implement this into their classroom.